Venus rules Love, beauty and relationships. Venus is aesthetic, artistic and romantic, while Neptune is spiritual, dreamy, imaginative and has escapist tendencies. 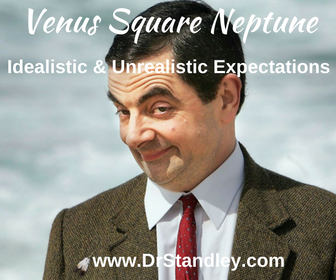 Neptune is also the higher octave of Venus. This aspect is idealistic and unrealistic (quixotic) when it comes to personal relationships and personal money. This source of the word 'quixotic' is from the great Spanish novel "Don Quixote," whose title character is given to unrealistic schemes and great chivalry. Consequently the individual often feels disillusioned and sorry for themselves and blames others for their perceived lack of understanding. There is a strong need to develop a healthy respect for oneself and respect for others based on realistic expectations. Read more in my Astrology Aspects eBook - click the graphic below!